This recipe comes by request from Nicole in Washington who wrote in on the Healing Cuisine Facebook page. 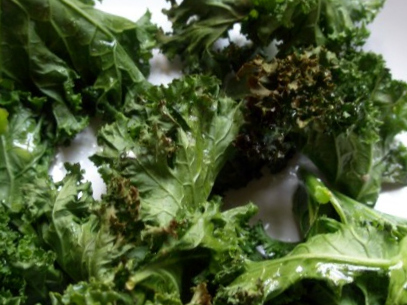 I am happy to share one of my most favorite and super easy snacks with you — Kale Chips. Great on their own as a snack or along side lunch. They’ll leave you wanting more!! A truly healthy alternative to potato chips, kale chips (when left in their raw state) are a healthy carb rich in vitamins A, B, C, K and fiber. Now, you will find other recipes out there suggesting that you bake your kale at 350 degrees or other high temperature. What I urge you to realize is heating the kale at such high temps denatures the antioxidants and nutrients in the kale. Also, if you’re baking your kale until it’s brown or black, those patches are carcinogenic and have been linked to causing disease in the body, namely cancer. Kale chips gained their buzz first in the Raw community. Research is further backing the benefits of eating a raw diet. To keep a food truly raw, it should not be heated at more than 118 degrees F. This preserves the enzymes in the food. To achieve Raw Kale Chips (heated no higher than 118 degrees) you can use a dehydrator. Unfortunately we don’t yet own one…they’re pricey little things, but I’ve got my eye on an Excalibur when we do have the funds. Same with a VitaMix… haha.. well anyway, back to making kale chips. I’ve had the pleasure of enjoying raw, dehydrated kale chips from a friend and it really takes them to a whole new level. But if you don’t have a dehydrator, I will also give you directions for your oven (at a low temperature to save some of the nutrients!). 1.) In a large bowl, add kale pieces and olive oil. Get in it with your hands and massage the olive oil into every little nook and cranny of each leaf. There should be barely enough oil to coat the leaves. They should not be soaked/dripping with oil. If so, this is too much and you’ll get soggy kale chips. 2.) Spread your kale pieces evenly onto two dehydrator trays (or two baking sheets if using oven). Sprinkle with sea salt and any other seasonings. 3.) DEHYDRATOR: Place trays into dehyrator and dehydrate at 115 degrees F for 6 hours. Remove and enjoy! 4.) OVEN: Preheat oven to lowest possible temperature (most ovens this will be 200 degrees F). Place baking sheets in oven and bake for about 2 hours then check for crispness. You may prefer to bake them a bit longer, but I like mine removed after 2 hours. Dehydrated kale chips will stay crispy for about 3 to 4 days when stored in air tight container. Oven kale chips should be consumed within a few hours as they’ll get soggy in less than one day. Hope you enjoy this easy and tasty snack! It’s funny, because I just discovered kale chips a couple of weeks ago. Did you know that you can turn your oven on to the lowest setting for a few minutes, then turn the oven OFF and turn the light ON to keep the oven temp at around 100F? I’ve used this method to make raw milk yogurt, and it works great. You just have to make sure not to open the door because that lets all the heat out. I would recommend turning the oven back to the lowest setting for another minute then turning it off again (with the light on) to heat it back up each time you open to check the chips.